I've been thinking about doing this post for a while, I use eBay alot and I'm always getting friends asking me tips on the best way to sell things or how to get a bargain so I thought I would use all my eBayers knowledge (which is a little bit) and pop it into a post for you all! Weather you are a first time ebayer or maybe you want to make/save a little bit of money hopefully these points will help you like they have helped me! They are super easy (and some of you may say obvious) and rules that I live by when on eBay. This is going to be spilt into 2 posts the first being tips for buying and the second being tips for selling. 1. Getting A Quick Bargain Find - Most of the time when I am on eBay I'm not actually looking for anything in particular, me, I just love a bargain. What I like to do (which is really easy way of finding a steal) is search a word/brand/item name, for example "Topshop" then sort the items to "ending soonest". This is the perfect time to find a bargain and quickly. You get produced with the items which only have minutes left and if you can see that they haven't had many bids or it is still super cheap - there is your chance to bid and win! 2. Shop Around - If you are searching for a particular thing then make sure you shop around, especially before bidding or hitting 'Buy It Now'. This refers alot to "eBay shops". There are hundreds of thousands of them all offering more or less the same thing for more or less the same price. If there's a bag you like and you've found it on an eBay shop, search for it again and check out the other shops that are selling it, maybe a different shop will have free postage or maybe the one you were looking at was from Hong Kong and this bag is posted from the UK (time saving), it always pays to do a quick search to check out the competition, at the end of the day it's all about getting the most for your money. 3. Search Details - This is an obviously one but there is no point just searching for a word like "Dress". You are going to be inundated with every single dress on eBay weather it's womens, kids, babies or fancy dress! Be specific, if you want a leopard print dress, search 'leopard print dress' and if you know what style you want search it - 'leopard print swing dress'. Even better if you know what brand you want it too be by e.g. 'ASOS leopard print swing dress' - this makes it ten times easier for you to find exactly what you are after. Don't forget you can use the options on the left hand side to determine what sizes you are searching for and what condition the item is in, so if you want only Size 10 dresses that are brand new - easy peasy just click the options! 4. Check Feedback - especially with shops. If something seems really really cheap and an out of this world deal - check the sellers feedback. The great thing with eBay is you can see everyone else's opinion of something before you buy it. If you love the look of a dress but not sure on how the quality will actually be, check the sellers feedback. If there are comments saying that it is bad material or "not how it looks online" you know to stay clear and not bother but more often than not you'll see a positive comment like "arrived and better than I thought" which is the perfect reassurance! Also good for individual sellers so you can see how quickly they are sending things out and in what condition and if they are describing things honestly. 5. Postage Prices - when bidding on a item always take into consideration the postage fees aswell. You can see them right there, right then when you are bidding! You may have found a bargain pair of shoes for £1.50 but if the postage is £7/8 you are nearing a tenner before the bidding is nearly over! It's always best to add it all together before you start bidding and think weather you wanna spend that much! 6. Lookalikes, copies and fakes - Now you may have gone onto eBay purposely to find one of these (lookalike or copy), like the celine t-shirt I've been seeing so much of and if you are then good on you! Who's gunna know right? BUT if you really are searching for Designer goods e.g. a chanel handbag - beware. Ebay is FULL of scammers and as amazing as the eBay are at their job I'm sure that people ripping other people off are still getting through the cracks. Always feel free to ask the seller as many questions as you want, if you are going to be paying alot of money for this item you have the right too! Ask them what it comes with (e.g. Dust bag? Authenticity card? ), why are they selling it? where did they get it from? If they are legit they won't mind answering these questions at all. If you are looking at a "100% authentic" designer bag for about £20 from somewhere outside of the UK (china/hong kong) I can tell you now - it is fake. Saying this something I don't think eBay is always great for is high-end make-up. There are way too many 'good fakes' for top make-up brands out there, benefit being top of the list - but like I said before, always check the feedback for reassurance. 7. Ask Questions - I said this in point 6 but asking questions is something you shouldn't fear. If you want to know anything about a product my first tip would be to properly read the description the seller has written there might be something written there that will answer your question. If not don't be afraid of asking the seller questions! If something is a S/M and you are wondering weather it would fit a size 12 - ask them! The worst they are going to say is no! Or if you are buying more than 1 item from a seller or a shop, ask them if they would do combined postage - if you don't ask, you don't get or won't know! If there is a trend or particular style you are loving - search it. I, for instance, LOVE Little Mix's style so I like to search Little Mix into the women's clothing category and see what comes up! I also love to search 90s and see what styles and items I can find! Same as things like TOWIE or The Kardashians, there's no harm in searching it if you have seen something they have worn or maybe you just like their style! Searching "as seen on ...." is a brilliant way to find an item you have seen and loved on a celeb or in the press! Great if you like Kate Middleton or Mollie King's style as they are known high-street shoppers! 9. Watch Items - You've seen something, you love the look of it but it has 5 days left and you don't fancy bidding yet? - add it to your watchlist! You can keep upto date with it's bids and see if the price is increasing alot and if it gets too expensive and you are no longer interested - unwatch! I do this alot if I don't have alot of money at that moment and I see something which is "Buy It Now" or has a while left - I keep it in my watchlist until I can afford it! That way I don't forget about it and miss out either! 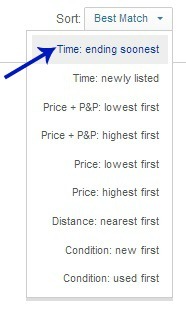 Also great if you are looking at lots of the same thing, that way you can always bid on the cheapest item! 10. Get The App -If you have an iPhone (and I'm sure most other phones nowadays will have it too) I would highly recommend getting the app (it's free!)! You can follow your watchlist, bidding list and selling lists on the go and get notifications if something is ending soon or you are outbid! It means you can bid whilst on the go - the worst thing ever if not being near a computer when an item you have been bidding on is ending and loosing out on it at the last moment! Get it today! 11. Be certain - Before you hit confirm on a bid or 'buy it now' I would just say be 100% sure. Make sure you've checked all the information, the postage cost and the postage time included and know that you are sure! There is nothing worse than being a seller and someone winning an item and then telling you they don't actually want it - not fun and alot of time wasted. 12. Time & Place - Make sure when you are bidding that you are checking where you are buying from! If you are looking at something and want it for the weekend there is no point in buying it if it is from Hong Kong! Luckily now you can see an expected arrival date which helps alot! If a person or company is in the UK though and you really do need that item sooner there is no harm in asking them if they could send it earlier if possible or offering them a little extra to send it 1st class or recorded. Good tips. I don't shop much on eBay anymore, but for those that are new to eBay these are great and for those who haven't been on in a while (it has changed a lot!). Great advice. I spent so much time on Ebay and it's very rare that I actually win anything. I was lucky enough to just about get a dress for my holiday today, but i've lost so many others! This is a great post for eBay newbies. I couldn't have said it any better.